82 year-old Jim Taglione of Providence believes the ill fated airplane mentioned in the February issue of Your Smithfield Magazine was the same one that once belonged to his uncle, Joseph Taglione, before Ralph Wilkins came into possession of it. “My uncle cracked up a few airplanes.” said Jim as we sat sipping coffee in a local restaurant pouring over scrapbooks containing vintage photographs. One photo in particular showed his smiling uncle sitting atop a wrecked airplane. Joseph Taglione was a fairly well known aviator in his time. Born in Italy, he learned to fly in 1921, and in 1928 was honored by the Sons of Italy as the first Italian American flyer in Rhode Island. It was during the 1920s that Taglione established Rhode Island Airways with $1,500 he borrowed form Jim’s father. On weekends he would offer plane rides, sometimes making as much as $800. While reading the article about the jinxed airplane, Jim became convinced that it was the same aircraft once owned by his uncle, particularly when he read about the accident where the landing gear had snagged the roof of an automobile. “How many of those could have happened?” he asked, for not only had his uncle experienced such an accident, he had done so with the same make of airplane. If he didn’t reveal his octogenarian status, Jim could easily be taken for a much younger man. Like his late uncle, he too loves to fly and has been doing so since he was sixteen. Jim also shares a connection to Smithfield for it was at the old Smithfield Airport where he learned to fly in 1943. The cost was six dollars for a half hour of instruction. Each week he would take another lesson with his instructor Butch Boucher, who was also the airport manager. The rules stated that one had to have a minimum of eight hours of instruction before they could fly solo, but Jim soloed after only four hours and twenty-five minutes. Butch took a liking to Jim and offered him a job patching holes in the airplanes. Many aircraft of that era had canvas “skins” tightened by aviation “dope” which allowed for good aerodynamics and lighter aircraft weight. The “dope” was a glue/lacquer mix that shrank as it dried. The first time he set out to make a repair he learned what a messy job it could be if not done right. The “dope” was kept in a 55 gallon drum which lay on its side. Not knowing he was supposed to tilt the drum before removing the plug, the dope came gushing out and quickly over-flowed his five gallon bucket. To make matters worse, he accidentally dropped the plug into the bucket during the process. With the liquid flowing and no way to stop it, he was forced to put his whole arm into the bucket to fish for the plug. On another occasion a man who owned a J2 Cub told Jim that if he would polish his plane he would give him a ride. Jim brought out a step ladder and began polishing the top of a wing and promptly pushed through the rotted canvas! Jim repaired the damage, but soon discovered that the rot wasn’t contained to just the wing. “That plane had ripped fabric all over it that the owner just kept patching” Jim recalled. Smithfield’s airport only had one hangar, built by John Emin, Sr., in 1932. Jim recalled that in order to fit more aircraft inside, some of the airplanes could be tipped forward letting the nose rest atop a five gallon bucket. However, this could only be accomplished with certain planes such as Piper Cubs or Aeroncas. During World War II, the U.S. Government mandated that the civilian aircraft at Smithfield’s Airport had to be taken inland, so one winter’s day Jim flew with a pilot who needed to take his plane to an airport in Palmer, Massachusetts. They left Smithfield with nothing more than a standard road map to guide them, and not surprisingly they got lost. The pilot set down in a field where he asked a farmer for directions. The farmer pointed towards a large hill and said Palmer was “that way”. They eventually reached their destination, and Jim remembers freezing all the way back because he was forced to ride in the rumble seat of the car that had met them there to take them home. Jim’s mother Margaret Taglione, and his other uncle Gene, ran a small luncheonette at the Smithfield Airport that sold spaghetti and meatballs as well as different types of sandwiches. The photographs belonging to Jim indicate it was a small establishment, but then how big did it have to be to service the tiny airport? Although he never knew it at the time, the airplane that had once belonged to his uncle Joseph had crashed at the very airport where Jim learned to fly. In fact he never even knew of the accident until reading about in the magazine. The only accident Jim remembered hearing about was the time another plane damaged its landing gear when it hit a gofer hole on the field. In December 1945, Jim enlisted in the U.S. Navy, but although he was a licensed pilot, he lacked the college credits to be a naval aviator so he was relegated to the ground working around aircraft he would never be able to fly. After his stint in the navy, he returned to Rhode Island and resumed flying. In 1978 he purchased a Cessna 172M, an aircraft he still owns and keeps at North Central Airport. 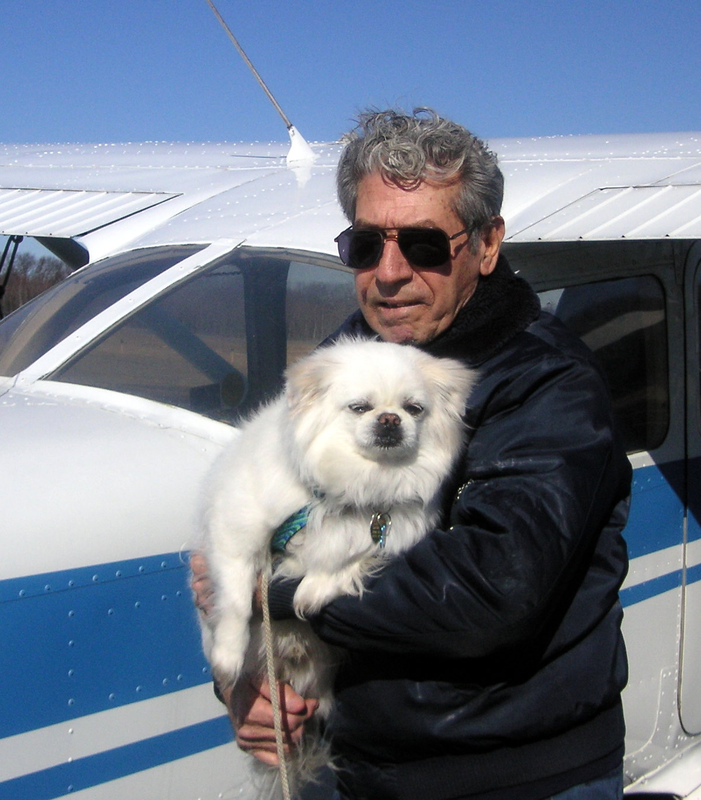 Since taking his first flying lesson in 1943, Jim has logged over 4,000 hours of air time, some of which he has done with his dog Snickers, a small mixed breed that routinely accompanies him wherever he goes. As far as any jinx is concerned, Jim doesn’t believe in them.